The Seahawks face the Minnesota Vikings in an NFC wild card game Sunday (10:05 p.m. PT kickoff) less than a month after blasting Minnesota 38-7 in Minneapolis. A resounding 36-6 winner over the Arizona Cardinals Sunday in Glendale, AZ., the Seahawks (10-6, 2nd, NFC West) finished the regular season as the NFC’s No. 6 seed and face the Minnesota Vikings in a conference wild card game Sunday in Minneapolis’s TCF Bank Stadium (10 a.m. PT kickoff, NBC). The Vikings won the NFC North Sunday night with a 20-13 victory over the Green Bay Packers at Lambeau Field. The matchup is the second between the teams in less than a month. Seattle rolled at Minnesota 38-7 Dec. 6. ABOUT MINNESOTA: The Vikings started 2-2, but won six of their next seven to improve to 8-3 before falling to the Seahawks Dec. 6 and the Arizona Cardinals (23-20) four days later in Glendale. The Vikings rebounded, ending the regular season with three consecutive victories, defeating the Chicago Bears (38-17) and New York Giants (49-17) in weeks 15 and 16 before holding off the Packers Sunday night, ending Green Bay’s four-year reign as NFC North champions. Under head coach Mike Zimmer, the Vikings finished 15th in the NFL in scoring offense (23.0) this season and sixth in scoring defense (19.3). 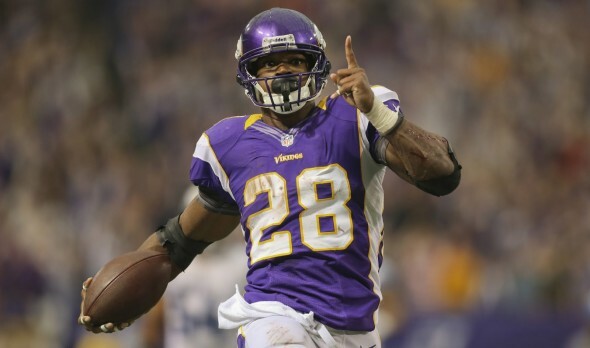 RB Adrian Peterson led the NFL with 1,485 rushing yards (third career rushing title) and scored 10 TDs. Second-year QB Teddy Bridgewater, who completed 10 of 19 for 99 yards with one interception against the Packers, threw 14 TDs with nine INTs (completed 65.5 percent) and a 90.6 passer rating. WR Stefon Diggs topped Minnesota with 52 catches for 720 yards and four TDs. WEATHER FORECAST: Sunday high of 16 degrees, low of zero. Ten percent chance of snow. SERIES RIVALRY: The Seahawks lead 9-5 (regular season) and have three consecutive wins over Minnesota . . . The Seahawks are 3-3 all-time in Minnesota, including 3-2 in Minneapolis. PLAYOFF HISTORY: Seattle and Minnesota have never met in postseason play. This is the Seahawks fourth consecutive playoff appearance. The Vikings are in the playoffs for the first time since 2012, when they lost in the wild card round. LAST MEETING: The Seahawks whipped the Vikings 38-7 Dec. 6 as QB Russell Wilson threw three touchdowns passes (including a pair to WR Doug Baldwin), rookie RB Thomas Rawls rushed for 101 yards and a TD, and Seattle’s defense held Petersen to 18 yards on eight carries. With Bridgewater tossing for a season-low 118 yards, the Vikings managed only 125 total yards, lowest total since 2006. The Vikings were without several key defensive players. NO. 6 SEED: Only two No. 6 seeds have won the Super Bowl, the 2005 Pittsburgh Steelers (over Seattle) and the 2010 Green Bay Packers. Bridgewater had better be in great running shape, as from what I saw today in Phoenix, the Hawks’ pass rush is intense. Basically a bye week. Not only is Bridgewater untested in the playoffs but the Vikings have yet to play a home playoff game outdoors. This will be their first one. Hope Tavaris will be ready to play. You don’t think the zero degree weather will be a factor in Minneapolis’ favor? Yes just ask the Packers who had defeated the Vikings soundly at their stadium before last nights game.Its not going to be a picnic esp with temps reaching into single digits by games end. But you know what they say about a shark and blood?Sea realizes how tough it was to climb onto this perch and it would surprise most of us if they succumbed. You def know you wont see a flat performance like we saw vs the Rams. A Sea team on their game is very dangerous for the unfortunate Nordic raiders. Go Hawks! This is the playoffs, seed #’s and recent history do not matter. Everyone including game planners amp up. The D will be ready and if the O-line can continue to give RW that extra 2-3 seconds he needs (rather than a jailbreak) for the play to run out they should be fine. I think the Vikes will devise some new wrinkle to come after RW. We’ll see if Hawk coordinators can anticipate it. I will be surprised if Beast plays in this one – too soon . . .